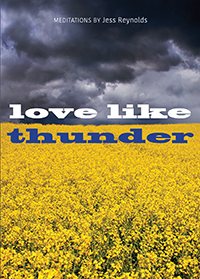 In Love Like Thunder, the 2018 volume of the inSpirit series, a vibrant new poetic voice invites us into an intimate relationship with nature, God, and love itself. Jess Reynolds weeps in the desert at night, meditates on heart emojis, lets a river of love run wildly in their body, and together with their partner God goes to couples counseling to find their way. Jess Reynolds’ lyric poetry flows like water between genders, between body and spirit, and between earth and sky. eager and hungry and holy. and tumbles down a mountainside. and the tide pulling away from the shore. breathing so hard she might crack open.